Planning a Patagonia vacation is a challenge, in part because the area is so vast but also because its sights are so numerous. First decide whether to visit Chile or Argentina or both. You can’t go wrong. Both countries offer their own pleasures. Here are some to ponder that may help you choose. Turquoise and massive, the terminus of this famous glacier is one of the continent’s most breathtaking sights. Boats take visitors across Lago Argentino for close-up views to appreciate its scale. Though advancing, it periodically drops slabs the size of a Volkswagen from its face, a thunderous spectacle. Known for its pristine fjords and towering evergreens, this scenic region attracts many visitors to the parks near Argentina’s famous ski area, Bariloche, on the shores of Lake Nahuel Huapi. Bicycling or hiking through the redwoods of Los Arrayanes National Park and kayaking in Nahuel Huapi National Park are heavenly experiences. Chile’s most famous hiking destinations are found in Torres del Paine National Park. Right across the border is Argentina’s Los Glaciares National Park. Their proximity makes visiting both destinations in one trip easy to do. Penguins inhabit various parts of the region in both Chile and Argentina. For many visitors, the ultimate penguin experience is to walk among them at Punta Tambo in Golfo San Jorge Marine National Park. Between October and March, hundreds of thousands of Magellanic penguins nest and give birth here, the species’ largest colony in South America. 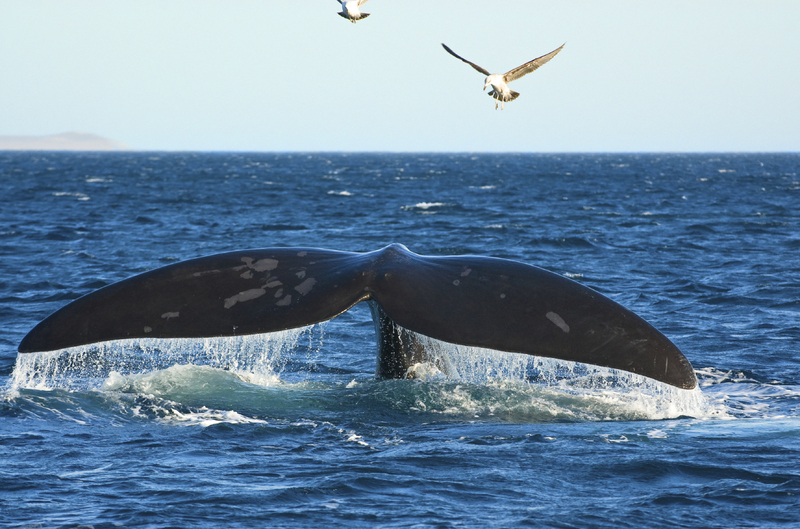 Two of the largest whale species encountered during travel to Patagonia are the blue and southern right baleens. From February to April, off the northwest tip of Chile Patagonia’s Isla Grande de Chiloe, blues and their calves may be seen from shore, an area also frequented by humpbacks and fins. A famous spot to see the gigantic, shallow swimming southern right is at Puerto Piramides off Argentina’s Valdes Peninsula between June and December when they arrive to mate and give birth. Depending on how you define it, Patagonia gets you pretty close to the bottom of the planet. In Ushuaia, Argentina’s most southerly city, you can spend the cocktail hour in a bar constructed of ice. 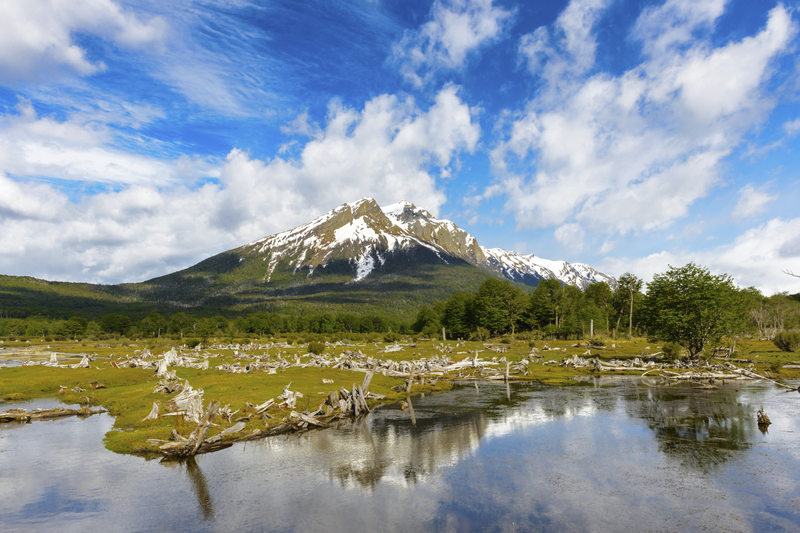 And then there’s Tierra del Fuego, the final piece of the continent, filled with natural wonders including Tierra del Fuego National Park. If you choose to venture still further, Antarctica awaits. Many of the sprawling sheep ranches, established when the colonists settled in Patagonia, have turned their establishments into guest estancias. These accommodations offer sweeping views of the spectacular landscape as well as an opportunity to ride horseback across the pampas. Patagonia has glaciers galore, many in Argentina and even more in Chile. Some can be hiked, others seen only from afar. 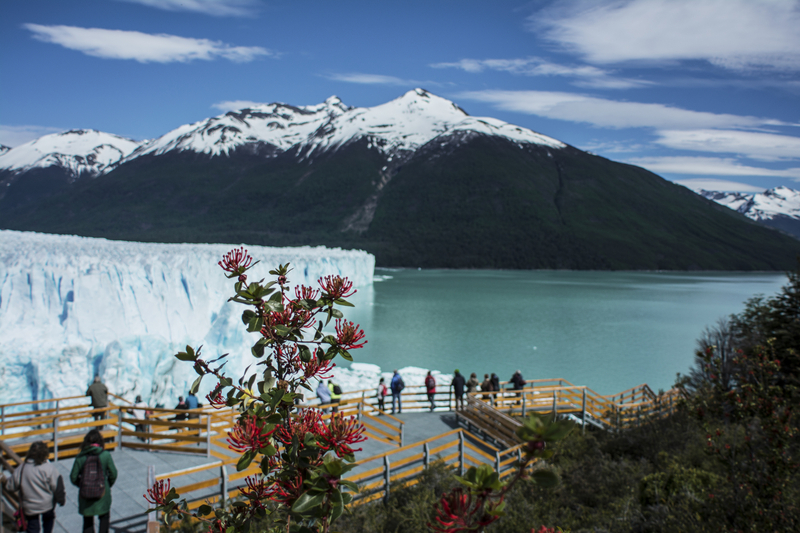 Chile Patagonia’s Grey Glacier offers the experience of maneuvering around icebergs in picturesque Grey Lake. Scenic canyons, exhilarating Class III to V rapids and permanent platform river camps make this a glamping experience to remember. A trail along the river allows visitors to break up the whitewater with some horseback riding or circumvent whatever rapids they find too challenging. One novel way to travel from Chile to Argentina is through this legendary waterway that divides Patagonia from Tierra del Fuego. 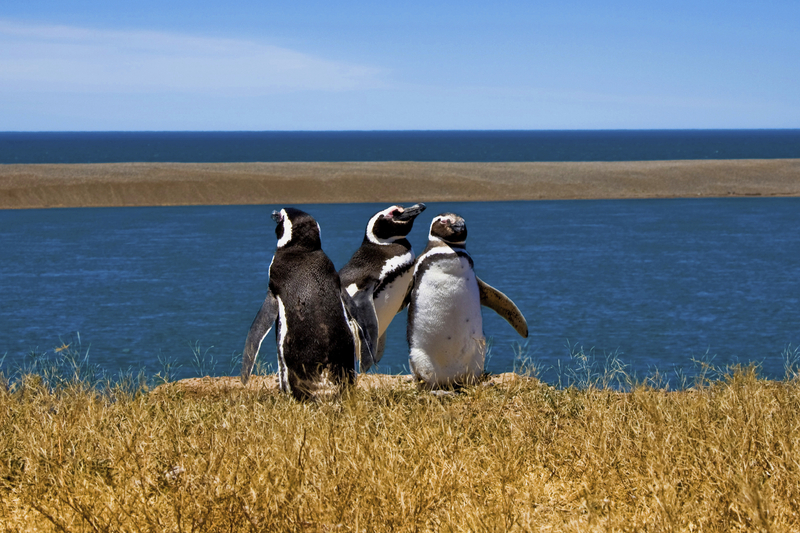 One highlight along the way is tiny Magdalena Island, where over 100,000 Magellanic penguins come to mate each year between October and March. We invite you to visit our Patagonia trips and tours online! "The W trek is a trip of a lifetime and the experience was great."